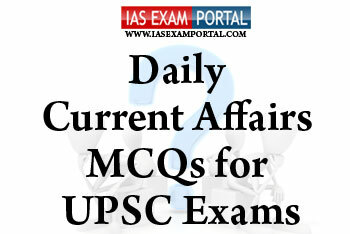 Current Affairs MCQ for UPSC Exams - 12 October 2018 | IAS EXAM PORTAL - India's Largest Community for UPSC Exam Aspirants. Q1Which of the following statements regarding Global hunger index 2018 are true ? 1) India has shown a rise in percentage of ‘wasted children’. 2) Maternal BMI and access to improved water and sanitation are more closely associated with rates of child wasting than household wealth. 3) The only country with a higher prevalence of child wasting is the war-torn nation of Afghanistan. 1) Aviation fuels consist of blends of over two thousand chemicals, primarily hydrocarbons (paraffins, olefins, naphthenes, and aromatics), additives such as antioxidants and metal deactivators. 2) Much of the weight of an aircraft goes into fuel storage to provide the range, and more weight means more fuel consumption. 3) Certain countries use alcohol & alcohol mixtures as an aviation fuel additive to get more peak power during landing and take-off. Which of the above statements are not correct ? 1) Proactively or reactively inquire into violations of government of India human rights or negligence in the prevention of such violation by a public servant. 2) by leave of the court, to intervene in court proceeding relating to human rights. 3) encourage the efforts of NGOs and institutions congress to working in the field of anti human rights. 4) review the factors, including acts of terrorism that inhibit the enjoyment of human rights and recommend appropriate remedial measures. 5) to study treaties and other international instruments on human rights and make recommendations for their effective implementation. Q5Which of the following national park in India shares an international border with Bhutan?